Slideshow: Auto wraps are a convenient way to quickly alter your car's appearance without costing a fortune. 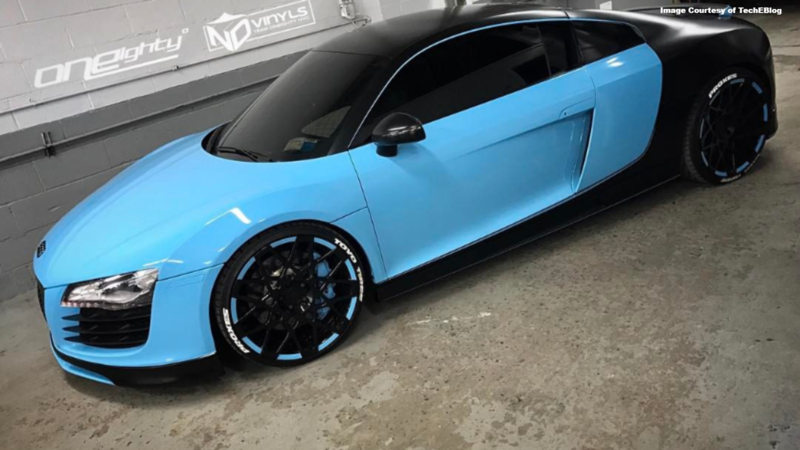 The best part is that you can generally remove the wrap as quickly as you applied it, which makes it easy to experiment with various styles without worrying about restoring the car to its original state. 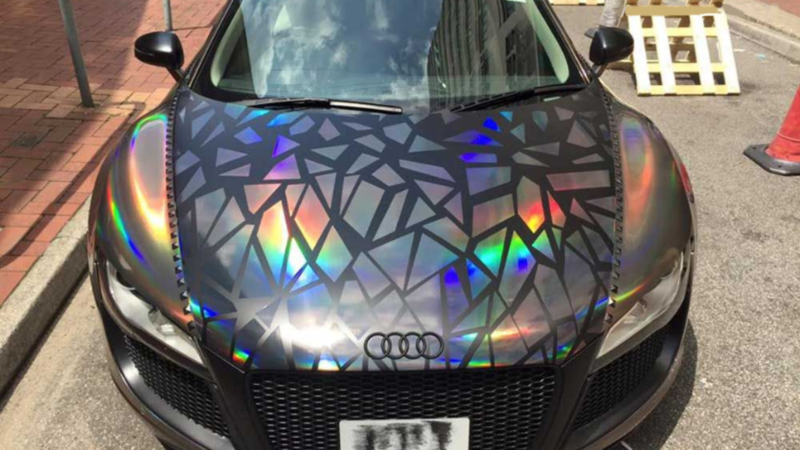 These weird Audi auto wraps can provide inspiration, or simply entertainment if you're not yet ready to invest in a wrap. The mesmerizing appearance of a holographic wrap makes it a practical choice if you're looking going for bold and attention-grabbing. The multi-color light reflection is especially noteworthy on a bright sunny day. Because of the nature of holograms, the design might even appear to move as you gaze around it, even if the car is stationary. Most of us work hard to keep our cars from looking rusty. Don't worry if you're actually going for that rust-covered appearance, though, as you can get the job done with faux rust wrap. This Audi A4 is covered in the stuff, making it look like it's spent years driving around the rust belt without ever getting a bath. The good news is that if you get tired of the look, you can just peel off the rust wrap and be greeted with a (hopefully) rust-free paint. 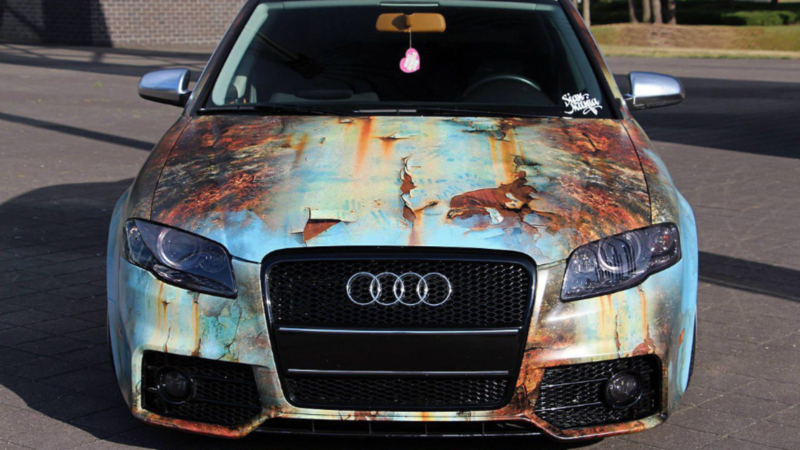 >>Join the conversation about these car wraps right here in the AudiWorld Forum! 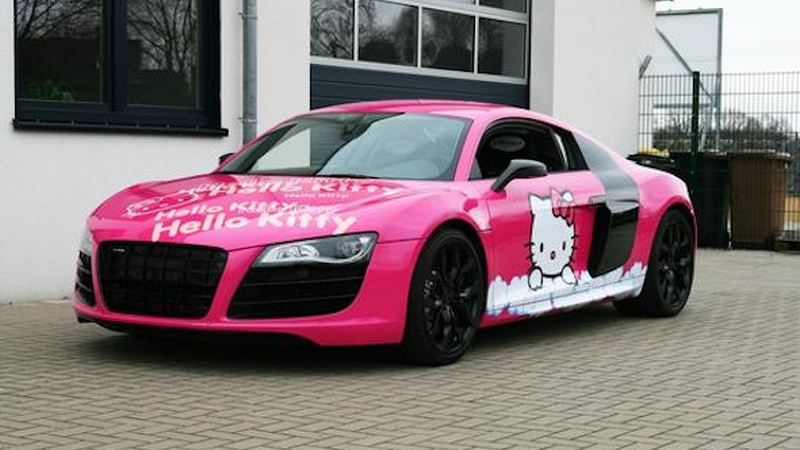 The entire body of this Audi R8 is draped in a Hello Kitty wrap. If the hot pink hue isn't enough to grab your attention, the massive kitty design on the side sure will. Facing the car head-on, you may see its bold Hello Kitty lettering first. At least a few parts of the car, like the wheels, grill and side mirrors, are still black. 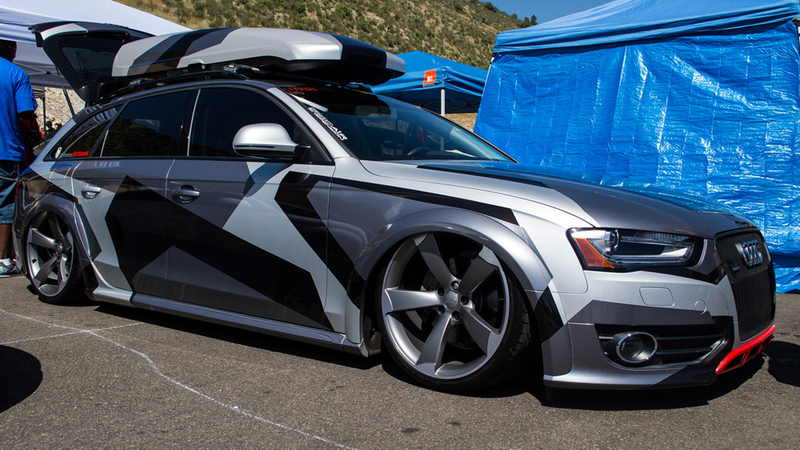 It's hard to know where to begin training your eyes on this Audi A4 Avant, which is designed with a Savannah wrap. You might want to start with the side, which looks like a blend of zebra prints complete with at least a partial jungle theme. At least the wrap goes in a continuous flow around the vehicle, which makes its contrasting colors and images slightly less jarring, at least to my eyes. This isn't the busiest design as far as weird wraps go, but it's one of the more bright-colored ones in this list. 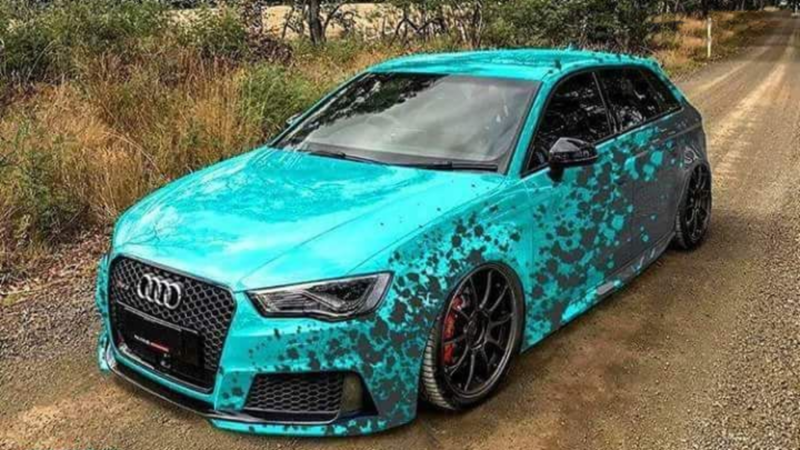 The bold turquoise in front is marred by darker specks, which become larger areas as you move towards to the rear of this Audi Rs6. In some ways, it's a handy wrap for drivers who frequent muddy routes, as the contrasting colors can be particularly helpful when it comes to hiding dirt and grime. It's no secret that prototype wraps are legitimately useful for keeping innovative vehicles hidden from prying public eyes until it's time for their debut. Still, it doesn't make this prototype wrap look any less silly. In fact, it looks like it would make a good getaway car after a midnight robbery, as long as there's actually enough visibility out the front. The weird part about this wrap isn't really the fact that it resembles the Bugatti Chiron supercar. It's that underneath the cloak is a car that doesn't have the performance to match an appearance. For starters, you won't find the coveted 8.0-liter quad-turbocharged W16 engine underneath the hood. And as awesome as the R8 is, the covered Audi also lacks the phenomenal 1500 horsepower found in the Chiron. 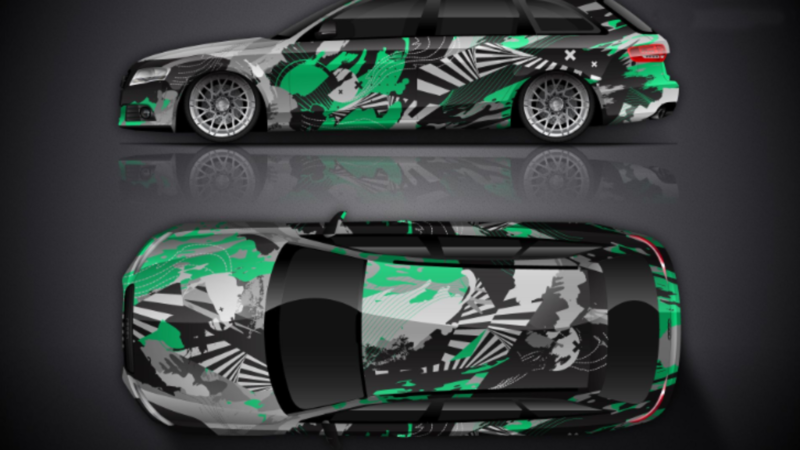 Not only is the entire car enveloped in a camouflage pattern, but the wrap also extends to the luggage carrier on top of the car to the roof, as well as the luggage carrier. Virtually every part of the Allroad is covered, except for the lower part of the front grille, which is red. While the camo wrap might help the car blend in during an off-road safari adventure, it seems to have the opposite effect everywhere else.